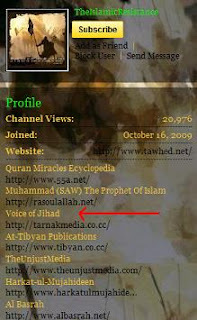 Case in point: JihadTube user TheIslamicResistance parks his channel & links to several terrorist websites such as "Voice of Jihad", the Taliban's official website. Oh, and in case anyone wondered what happened to Samir Khan's old blog "Ignored Puzzle Pieces of Knowledge" -- he links it. Helpful critter isn't he? Also notice that a former jihadi troll here, "Censored31", is linked along with one you should be very familiar with - Revolution Muslim. He also linked to a Scribed entitled ' Jews & Christians Are Kuffar Disbelievers" in case anyone forgets that or something. Want to know about martyrs? No problem, PDF of "In the Hearts of Green Birds" is there too. Gee Google/YouTube you are so helpful to jihadis.